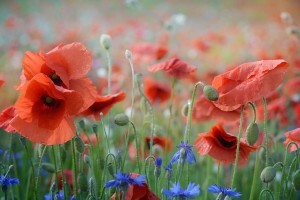 Deciding what colors to use in your garden is an opportunity . . . and, also a challenge. For many of us, it’s the closest we will ever come to painting on a canvas, except that this canvas is in our very own backyard. Professional garden designers have many “color theories,” but choosing your color scheme is as simple as remembering the basics: colors come in cool shades, warm shades and neutral (or monochromatic) shades. It’s up to you whether you want to complement or contrast your colors. Blue In The Garden. Blue cools all colors, adding a sense of space and peace to any composition. Blues can be bright or they can be soft and misty. If you’re a gardener who likes “true blue” shades (as opposed to purplish blues) you’ll like Forget-Me-Nots, Himalayan Poppies, Delphinium and Blue Angel Gentian Sage. Blues work especially well with warm colors, such as red, pink, orange and yellow but can be equally effective with neutral shades such as white, silver and green. Yellow In The Garden. 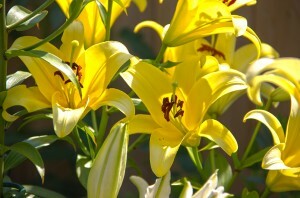 Your eye is immediately drawn to yellow and gold flowers in the garden which are radiant and bright. Like blues, yellows come in a variety of shades and can mimic a burst of sunshine or soft, shimmery gold. But yellow, more than any other garden color, can go from beautiful to brassy as the light changes in the garden from spring to summer. 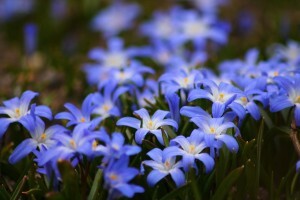 Because of that, many designers only plant yellow flowers in spring and fall, avoiding the color in the bright light of summer. It’s all a matter of taste, but I love yellow and gold in the garden (especially with blues and whites) all season long! Red In The Garden. Reds add drama to the garden and come in many, many hues from scarlet to magenta. Red flowers stand up and say: “Look at me” and because of this, most garden designers recommend pairing red flowers with flowers in the cooler shades of purple or blue. White flowers also work well with reds as they both complement and sooth a garden filled with bright red flowers. Finally, when deciding what colors to use in your garden, think about the kind of statement you want your garden to make: Dramatic or Dreamy? Soothing or Striking? Whatever you choose, just make sure to create a garden you absolutely love.